Last week, France and TV executives collectively held up their hands and took the blame for moving away from early afternoon starting times for races and committed to making changes. More power to them for acknowledging a change in course is needed. Also, more power (and advertising money) to them for bringing more than two cameras to races as was the case in the so-called good ol’ days of early cable coverage. These same officials also suggested the one of the rationales for why starting times in recent years have been constantly jiggered to later in the day. They wanted to suit viewers on the West Coast. If so, they must not know much about the lifestyle in the Pacific time zone. Residents on the West Coast are long used to Sunday morning TV times for sporting events starting in the early afternoon in the Eastern time zone. They often prefer to get them over early and head for the sunshine – or rain if in Seattle. These same folks in charge of how NASCAR has been televised ignored the fact the TV ratings had long been excellent in the Southeast during the years of the 1980’s and 1990’s when one could set the clock by cable coverage of NASCAR’s finest, which invariably began early in the afternoon. The recent mistakes in programming, to borrow a phrase, were probably also motivated by, ye gads, ratings factors – but not those of NASCAR. With late afternoon starts in the East, a network may have been trying to get a lead-in to their evening shows on Sundays to help boost ratings in the spring and summer. Or, trying to run opposite the NFL’s most interesting national match-ups during late afternoons in the fall to drag down other ratings. 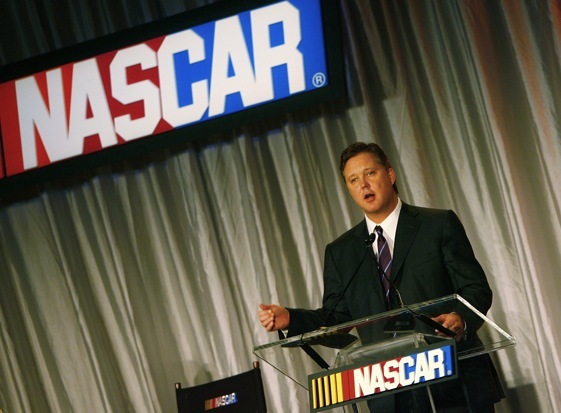 In other words, there’s been an effort to make NASCAR more hip, upscale and less southern. The huge irony: Stock car racing is and always has been a national sport, one that historically belonged to wage earners everywhere who worked with their hands and their backs for a living, or who started in that vein before moving into middle management. There weren’t any boundaries, including rural or urban, for this fan base. The first major stock car race featuring Roadsters with Ford’s new flathead V-8 was held in Los Angeles at Mines Field, two years before the first race on the beach in Daytona in 1936. The LA race was, ahem, 15 years before the first “Strictly Stock” race in Charlotte. All kinds of factors, led by the expertise of NASCAR founder Bill France Sr., contributed to the fact the southern-based version of stock car racing eventually rose to prominence versus competing stock car series from the West Coast, Midwest and Northeast. Better drivers and mechanics, more bootleggers with money to burn and faster clay racing surfaces are among the reasons France found the resources in the Southeast, where there were plenty of rival promoters, to launch a national stock car series in the 1950’s. France’s insistence on a schedule that included tracks across the country (through alliances with stock car promoters Ed Otto in the Northeast and Bill Barkheimer on the West Coast) was also decisive in his quest for a national sport that went well beyond the Beach and Road Course races in Daytona. If this sounds like a preliminary warm-up for Wednesday’s announcement in Charlotte of the inaugural class of the NASCAR Hall of Fame, well, so be it. It surely will be led by William Henry Getty France. “Big Bill” understood stock car racing to be a national sport with appeal to working folks everywhere. He recognized dirt tracks were in operation all across post-war America and figured out a way to link them together. He skillfully used a base in Daytona and the appeal of stock car racing in the Southeast as a way to leverage his vision, which really took off when he built the Daytona International Speedway. That was followed by the Roaring Sixties and high-banked super speedways not only in Georgia and North Carolina but in Michigan, Delaware and California. It appears that the people in charge these days at NASCAR along with the TV partners are again emphasizing the core audience for stock car racing – TV viewers who have Sunday schedules to keep and ticket buyers who must drive home when the race is over. In both cases, Monday morning comes early. In the days ahead, I suspect we’ll look back and wonder how the folks in charge ever got so far off track when it came to scheduling starting times. There’s an inkling, too, that they might have recently felt the ghost of “Big Bill” looking over their shoulders. Quote of the week: “I’m not really too worried, even if it all comes apart tomorrow. I can always go back to pumping gas.” So said NASCAR founder Bill France Sr. during an interview for a Sports Illustrated article that appeared in 1978. On the tube: If a team runs a split strategy like Target Chip Ganassi Racing in Saturday’s IRL race at Homestead that decided the championship, which driver would you rather be? The one who runs flat out like Scott Dixon to push Penske Racing’s Ryan Briscoe to do likewise or the one who saves fuel like Dario Franchitti? It’s a no brainer. If Franchitti saves fuel in the first 100 laps, he either has 1) more fuel and at least equal and maybe more horsepower in case of yellows in the second half; 2) a chance to bunch up for a slightly faster pit stop when it comes to re-fueling if a yellow falls, 3) a chance to catch a caution after lapping the competition during their pit stops, or 4) he’s in position to win the race and championship on mileage in the very odd case of no cautions in the final stages of the race, which is what happened. …Haven’t seen much in the way of a detailed explanation for why Greg Biffle, who usually has his reasons, squeezed eventual winner Joey Logano into the wall in the Nationwide Series race at the Auto Club Speedway. But there does seem to be a pattern developing among some veterans when it comes to the celebrated rookie. On the mind: One sometimes had the impression that NASCAR Vice Chairman Jim France and his son J.C. found much needed common ground in the Grand-Am paddock, where the younger France was a driver for Brumos Racing. Occasionally, you’d see the two generations standing together at Daytona as J.C. used his hands to talk about how his chassis was working in the way that only racers talk. If indeed the opportunity to race at Brumos was a bridge between the two, it’s no longer standing with J.C.’s indefinite suspension on cocaine charges. …Thanks and a tip of the cap to Jimmy Corley, who noted an error in my story on Friday. J.C. France won two Rolex Series during his career at Homestead and in Phoenix in 2003, both while co-driving with Hurley Haywood in a Fabcar-Porsche. …For the first time in recent memory, the Grand-Am’s Rolex schedule, announced this weekend, has only two conflicts with the American Le Mans Series schedule in 2010. Once again, both will race in Canada on the final weekend of August, always an important date for promoters north of the border. On the first weekend of August, the Rolex series will run a preliminary event prior to the Sprint Cup at Watkins Glen and the ALMS will join the IRL at Mid-Ohio.